Help support innovative classroom grants and scholarships! A state of Iowa tax credit may apply to annual donations of $100.00 or more when directed to the BCSF Endowment Fund. Donations directed to the Area of Greatest need will support initiatives as determined by the BCSF Board of Trustees. 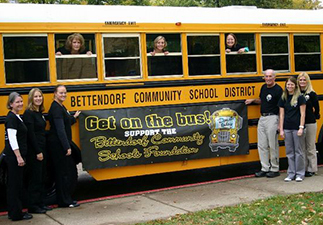 Donations to the Innovations Grants Fund will be awarded by merit throughout the school year to enhance the educational opportunities of students within the Bettendorf Community School District. A Memorial Donation will help the BCSF Endowment Fund grow while honoring the memory of a loved one. Your donation to the Scholarship Fund will help ensure college assistance for a variety of high achieving students within several academic disciplines. Recognize a favorite teacher with a donation to the BCSF Endowment Fund. A note will be sent to the teacher regarding this special honor.